Last month, we reviewed three AC1200 class routers in Part 1 of our roundup. Part 1 focused on routers from well known manufacturers and included the Linksys EA6350, NETGEAR R6220 and TP-LINK Archer C5. We had also intended to review the Amped Wireless RTA1200 router in Part 1, but we were unable to verify an FCC ID for the product. We contacted the company for information about the FCC ID, but as of this review, the issue still remains unresolved. However, Amped has stopped selling the RTA1200 on its website, but it's still available from other etailers. Until Amped resolves this, the RTA1200 is illegal for sale in the U.S. The RTA1200 now has a valid FCCID and is legal for sale in the U.S.
Part 2 of our AC1200 router roundup includes less expensive routers from lesser known manufacturers, namely the Totolink A2004NS and Netis WF2780. As we were gathering products for this review, Monoprice asked if we would like to review its 11538 AC1200 Wireless Dual Band Gigabit Router. When we got it in, however, we discovered it's a rebrand of the Netis WF2780, which we determined from its identical FCC ID registered to Netis, as shown below. This isn't a big surprise, since Monoprice's business model is to work with OEMs so it can offer low prices. The 11538, however, is only around $5 cheaper than the Netis WF2780. We had also intended to include the Tenda F1201 in the roundup, but ran into FCC ID problems again. The product has an FCC ID all right (V7TF1201), but we could not find it in the database. So the Tenda F1201 is also not legal for sale in the U.S. Since we haven't previously reviewed products from either manufacturer, we'll include a brief slideshow for each to provide a feel for the user interface. Additionally, each review will call out features that are unique or worthy of mention. Common features can be found in this table generated by the Router Finder. We'll cover comparative storage, routing and wireless performance in their own sections to that you can easily compare products. The Monoprice 11538 is the same product. 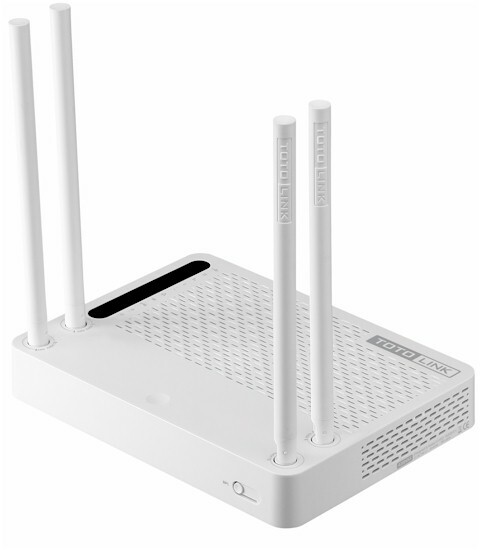 The Netis WF2780 is the only router in the AC1200 roundup designed to be used vertically, horizontally, or mounted to the wall. It comes with a plastic base, shown in the product photo above, to provide stability when using it vertically. It has four 5 dBi gain antennas - two each for the 2.4 GHz band and two for the 5 GHz band. The position of the antennas alternate between 2.4 GHz and 5 GHz with the 2.4 GHz antenna being the closest to the front panel. The antennas rotate for horizontal mounting as shown in the image at the top of this article. The front panel has 12 status LEDs that are easy to see from a distance. From bottom to top the LEDs are labeled Power, WPS, System, 5 GHz, 2.4 GHz WAN, and LAN 1-4. The rear panel has Gigabit Ethernet ports for WAN (1), and LAN (4), a power socket, a WPS pushbutton and a pin reset hole. There are no indicator lights on the Ethernet ports, and the WF2780 does not have a power switch or a radio on/off switch. The CPU is located in the center of the PCB. Two gray antenna wires appear to be adjacent to the 2.4 GHz radio, and the 5 GHz radio and front-ends appear in the lower left corner of the PCB. As with most routers, you don't have to do too much to set up the WF2780. The Netis Quick Installation Guide recommends using a wired LAN connection to set up the router. Once connected, you just point your browser to http://netis.cc and you'll be redirected to the Quick Setup page. By the way, all you get for documentation is the Quick Setup Guide; there is no user manual. On this page, you choose your language (English is the default), your Internet connection type and configure basic wireless settings for both bands. By default, both wireless networks are enabled with a similar default names: For the 2.4 GHz network, the name is netis_2.4G_XXXXXX where XXXXXX represents the last six digits of the router's MAC address. The 5 GHz network is named netis_5G_XXXXXX. Both networks ship with wireless security enabled and use the same default wireless password: "password". If you click on the Advanced icon, you land at the menu where you can configure all the WF2780's settings. The Advanced Setup page defaults to a status screen. However, the status screen seemed to be missing a lot of useful information such as time, date, number of current connections and router uptime. The submenus are listed on the left side of the screen. As you click on a submenu to view it, any other open submenu closes. The Wireless 2.4G and Wireless 5G submenus are identical, so I'll only include one band in the screenshots. Below, I'll briefly summarize the unique features of the WF2780 and will include screenshots in a gallery at the bottom of the page. The WF2780 is a very basic router without some of the features found on other routers in this roundup, so the gallery will be short. The interesting setting on this page is the Radio Mode. The WF2780 has five radio modes. It defaults to "Access Point", which is the normal mode when operating as a router. It also supports Repeater, AP + WDS (Wireless Distribution System), WDS, or client mode. The 2.4 GHz network only has choices for 20 MHz or 40 MHz channels. It defaults to 40 MHz. The default "Radio Band" setting is 801.11 b+g+n for maximum client compatibility. 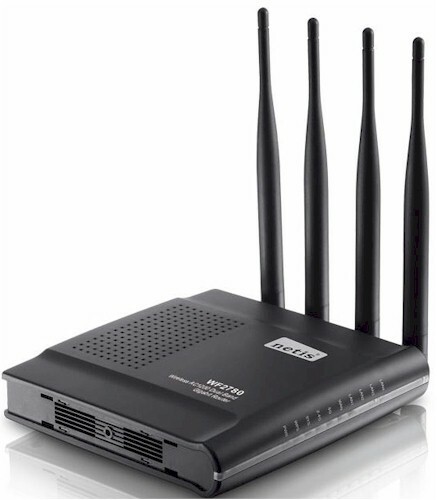 The Netis WF2780 supports up to three additional wireless network SSIDs for each band. Each can have its own SSID, security settings and can be configured to allow access to LAN + WAN or WAN only. There are radio buttons to enable/disable each configured wireless network as well as SSID Broadcast. Like the Totolink A2004NS reviewed below, the Netis WF2780 supports bandwidth-based QoS. QoS controls either guarantee or restrict bandwidth to hosts or a range of hosts for both uplink and downlink internet traffic. The WF2780 supports Port Range Forwarding. It lumps protocols (UDP and TCP) together with 13 common services such as HTTP, POP3, etc. Similarly, it supports port triggering, but has only a very limited number of entries. The Netis router permits access control by IP Filtering, MAC filtering and domain filtering. You can build rules to either permit or deny access for specific hosts or the entire subnet. You can also apply day of week and time of day scheduling to any of the rules you create. The WF2780 supports IP filtering, MAC filtering and Domain filtering. Each rule can be scheduled. The Totolink A2004NS is one of the more unique looking routers I've encountered. The A2004NS has four 4 dBi antennas sprouting out of the top of the case - 2 each for the 2.4 GHz and the 5 GHz bands. The 2.4 GHz antennas are located towards the front of the case on the right and left, and the 5 GHz antennas are mounted immediately behind them. The white case has a flat finish and the sides and top have numerous slots for ventilation. The bottom of the case is black and also has slots for ventilation and screw slots for mounting the device to a wall as well as four pre-installed rubber feet. The top of the case also has 10 blue LED indicators located towards the left rear. Looking directly at the front panel, the LEDs are obscured by the antennas. The front of the case has only the WPS (Wi-Fi Protected Setup) pushbutton. The callouts below show the LED description on the top panel and the rear panel layout. Note that the A2004NS does not have either a power switch or a Wi-Fi disable switch. The WAN port is yellow, and the four LAN ports are orange. The ports are identified with numbers of dots that correspond to the same dot pattern for the LED indicators on the top panel. There are no link/activity/link speed indicators on the Ethernet ports. The A2004NS is another Realtek-based router. We couldn't identify the memory or the 5 GHz power amplifiers. Other identified components are summarized in the table. If you compare the Totolink to the Netis, you'll see the key components are the same. The image below was taken from the FCC certification documents. As with all FCC ID photos, it's fairly low resolution. The LED indicators are located on the top left of the board. The 5 GHz radio (with amplifiers) has the black antenna leads; the 2.4 GHz radio (sans amplifiers) at the bottom center of the photo has the grey. From here, you can run the Internet Wizard (not necessary if you connected automatically) or the Wireless Wizard to set up your wireless network with different SSIDs, if desired and security. Unfortunately, this page appears every time you log into the router. To manage the router, you click on the Setup Tool icon. Note: I connected the Totolink router to a LAN port on my network for testing, which also defaults to 192.168.1.1. Before connecting it to my network, I changed the LAN setting for the router to 192.168.2.1. At the bottom of the screen above, the DHCP - Conneted (sic) refers to the WAN IP address. When you click on the Setup Tool, you land at the page shown below. This is what I consider to be the "real" landing page. The user interface has a clean, well-organized layout that separates the Basic Setup features from the Advanced Setup features. For many users, the Basic Setup menu is all you'll ever need to use with the exception of resetting the Admin password. By default, the user name/password is admin / admin. The setup doesn't force you to change the admin password, so you'll want to do that under Advanced Setup -> System->Admin Setup. The Status summary shows that the Internet is connected, the DHCP server is running using the full address range of the 192.168.2.0/24 network. Both wireless networks are running in AP mode with encryption, and remote management has been enabled on port 8080. The A2004NS has a full set of features that you'd expect to find on a high-end router plus a few that you might not expect. These features are all configurable from the menus under Advanced Setup. In the screenshot below, I've expanded the Advanced setup so that you can see the submenus. Each submenu can be expanded to reveal more configuration options. This screenshot also reveals several unique features for the DHCP server. Like many routers, the A2004NS supports DHCP reservation, AKA DHCP Static Lease. What is unique is that you have the option of blocking a MAC address on the list with a wrong IP address, or blocking a MAC address not on the list. Another unique feature is the ability to allow Internet access only for hosts that have been provided an IP address by the DHCP server. There are other interesting features that I'll highlight below. For each feature mentioned, I'll include a screenshot in the gallery at the end of this section. Each band can have two additional wireless networks per band, AKA guest networks. For each additional network, you can specify the level of security, a separate encryption key, enable/disable SSID Broadcast, use Enterprise authentication (802.1x) and allow full access or Internet only access. The A2004NS can be used in two different bridge modes. Wireless bridge mode will connect to any wireless network and connect Ethernet devices plugged into the router's LAN ports. Wireless WAN mode uses another Wi-Fi network as the WAN connection instead of the Ethernet WAN port. In this mode, the router creates a separate network with its own IP address range and DHCP server. In the Wireless Bridge mode, the router is used as an AP, so IP addresses will come from the DHCP server on the wireless host's network. The Wireless WAN mode is the same as Bridge mode except the DHCP server isn't stopped and will pass out IP addresses. In the Wireless WAN mode, the wired WAN port is disabled. The A2004NS supports port range forwarding and has 13 pre-defined services. You can have up to 60 forward rules. Port triggering is also supported, but there are no predefined rules, and the maximum number of port triggering rules is 10. The A2004NS has good control of management access including limiting access to up to 10 remote IP addresses or 10 IP addresses on the LAN. You can specify the remote management port, but unfortunately, there's no support for HTTPS secure management. You can use the A2004NS as a VPN server. However, it supports only PPTP and the maximum number of users is 5. For each user, you can assign an IP address on your LAN. QoS is accomplished by bandwidth control. You can ether guarantee a minimum amount of bandwidth to an IP address or range of IP addresses, or set a maximum bandwidth for a single IP address or range. Unlike some of the other routers reviewed in Part 1, there aren't different priority queues for different types of traffic. This is a unique feature that I haven't seen on other routers and is recommended only for advanced users. This menu lets you configure the maximum number of TCP/IP connections, maximum UDP connections, maximum IMP connections and maximum connection rate. These values are per connected host. This menu also lets you set TCP, UDP, ICMP and generic connection timeouts. This menu provides wired port information with link status, link speed and duplex. Wired ports can be configured to Auto or Manual and the link speed and duplex settings can be changed for the WAN port and LAN ports 1-3. Port 4 is configured for Auto only. In addition, Rx and Tx statistics are provided for all wired ports. This is a collection of miscellaneous setup items that don't fit neatly into other sub menus under the top level menu. In this menu, in addition to other settings, you can enable/disable UPnP. The A2004NS, like an increasing number of routers, provides a UPnP port forwarding list of ports opened by UPnP clients. This is a feature that I always look for in a router. When you insert a USB storage device, it is automatically recognized. However, it's not immediately available on your network. You have to individually enable you choice of FTP Service, Windows File Sharing (SAMBA) or URL service. For FTP and Windows File Sharing, you can have up to five users. Users must be created for each service - there isn't a device-wide user list. Each service can have up to 5 users, but there must be at least one user to start the service. With one user required for each of these services, you don't have "public" access for storage mounted on the A2004NS. Access for each user can be Read/Write/Read of Off. For the URL service, there's a single user ID and a you can set your own port. The default port is 8000. You can forward a range of ports. There are 13 predefined services, or you can create your own. You can create a PPTP VPN for up to 5 users. You can either limit or guarantee bandwidth to an IP address or range of IP addresses. You can set connection limits per PC and connection timeout periods for 12 types of connection timeouts. This screen provides port status, port link setup and individual port statistics. We tested storage performance using our standard router storage test process. Of the two routers in this review, only the Totolink A2004NS had a USB 2.0 port. The Netis WF2780 didn't have a USB port, so the tests couldn't be run. For comparison, I included test results of the #2 ranked NETGEAR R6220 from Part 1 of the AC1200 Class router roundup. In reviewing the benchmark charts, I discovered that the Totolink had the worst storage performance of any of the AC1200 class routers in either Part 1 or Part 2 of our roundup. We tested routing performance using our current Router test process. Each product was tested using the firmware indicated in the table below. All three routers have similar performance in the unidirectional tests. But the NETGEAR distinguishes itself with higher simultaneous throughput. At 4096 Simultaneous sessions, the Netis has the fewest number of supported sessions of any product tested with our current test process. Any of the AC1200 class routers reviewed in Part 1 or 2 have more than sufficient routing capacity for the majority of ISPs. Each router in this roundup was tested using our Version 8 Wireless test process using the firmware version shown in the table above. The router was first reset to factory defaults and Channel 6 was set for 2.4 GHz and Channel 153 for 5 GHz. 20 MHz B/W mode was set for 2.4 GHz and 5 GHz was set in 80 MHz bandwidth mode. The Benchmark Summary below shows the average of throughput measurements made in all test locations. The Netis held a slight edge over the Totolink for the 2.4 GHz Up/Down through (99.5 vs. 95.7 Mbps) but the Totolink had about a 10% advantage over the Netis for the 5 GHz Up/Down tests. The NETGEAR R6220, included from Part 1 of the AC1200 roundup for comparison, outperformed both routers in this review on every average wireless benchmark in the chart below. The composite image below shows the Throughput vs. Attenuation plots for 2.4 GHz uplink and 2.4 GHz downlink profiles. Looking first at the uplink profile, the NETGEAR R6220 starts out ahead of both routers in this review and stays "above and to the right" (better) throughout the entire test. The plot for the Totolink A2004NS stayed neatly tucked in between the top performing NETGEAR and the poorer performing Netis. Both the Totolink and the Netis dropped their connections with 3dB less attenuation than the NETGEAR. The Netis also dropped off significantly at 45 dB of attenuation to 3 Mbps. At that attenuation, the NETGEAR and Totolink had 34 and 29 Mbps throughput respectively. For the 2.4 GHz downlink profile, again, the story is pretty much the same. However, the Totolink and the Netis router tracked each other much more closely than on the Uplink tests. Both routers dropped their connections with 3dB less attenuation than the NETGEAR. The composite image below shows the Throughput vs. Attenuation plots for 5 GHz uplink and 5 GHz downlink profiles. For the 5 GHz uplink profile, the NETGEAR R6220 held a clear advantage over both other routers - especially with low attenuation / strong signal. With 0 dB of attenuation the R6220 achieved 366 Mbps. The Totolink A2004NS had 260 Mbps of throughput and the Netis WF2780 had 221 Mbps. However, for this test, both the NETGEAR and the Netis lost connection before the Totolink. The story is the same for the 5 GHz downlink profile. The NETGEAR starts out with a clear advantage at 0 dB of attenuation and holds that advantage throughout the range. The Totolink and Netis had almost identical results with their plots on top of each other for the bulk of the tests. However, the Totolink was able to hold on to its connection for an additional 6 dB of attenuation, though its throughput was 4 Mbps at 33 dB and 3 Mbps at 36 dB of attenuation. Note: Even though the NETGEAR's 5 GHz performance looks good compared to the performance of the Totolink and Netis routers, in Part 1 of the AC1200 roundup, I concluded that the NETGEAR was the worst performing of the three we tested. I included the NETGEAR R6220 for comparison in this roundup because it is priced similarly to the other two, and like the Totolink, has a USB 2.0 port. I decided not to include the Linksys EA6350 because it was significantly more expensive and has a USB 3.0 port. I didn't include the top performing TP-LINK Archer C5 because in reality, it's an AC1750 (3X3) router that is rate limited in the 5 GHz band. Using the Router Ranker, I filtered for test method Revision 8 and AC1200 class routers. The list currently contains all five AC1200 class routers including the three reviewed in Part 1. Having read through the benchmark summaries and performance vs. attenuation charts, it should come as no surprise that the Totolink and Netis routers are ranked lower than the products included in Part 1. The composite image below shows the individual category rankings for both routers in this review as well as the NETGEAR R6220. Here the #3 ranked Netis WF2780 edged out the Totolink primarily because of its routing performance. (Note: There was a tie at #2 for Total Router ranking). Both the Totolink and the Netis routers are Realtek-based and use mostly the same components, so it's not too surprising that they performed similarly. The Netis router's antennas had slightly more gain (5 dBi vs. 4 dBi), but it didn't really make much difference as seen in the performance vs. attenuation charts. While both routers could have had the same feature set, Netis chose to keep it simple and Totolink chose to expose additional features and threw in a USB 2.0 port for sharing storage. But as we saw in the storage performance results, the Totolink's attached storage results were the worst of any USB-equipped AC1200 class router in either Part 1 or 2. There's a lot of competition in the AC1200 class of routers and that has helped drive down prices and give consumers a lot of "bang for the buck". The two routers in this review were with $1.00 of each other as the review was written (Netis - $70, Totolink - $69), but prices change rapidly. In the end, while cheap, these two routers are the lowest-ranked AC1200 routers, so really aren't a bargain. For $20 more, why wouldn't you buy the top-ranked TP-LINK Archer C5?